The Oxford and Cambridge Boat Race has been held on the Thames between Putney and Mortlake since 1845. The idea for a rowing race between the universities came from two friends - Charles Merivale, a student at Cambridge, and his Harrow schoolfriend Charles Wordsworth (nephew of the poet), who was at Oxford. On 12 March 1829, Cambridge sent a challenge to Oxford and thus the tradition was born which has continued to the present day. The first Boat Race took place at Henley-on-Thames in Oxfordshire and contemporary newspapers reported that crowds of twenty thousand travelled to watch. The race was stopped soon after the start and, following the restart, Oxford emerged clear winners. 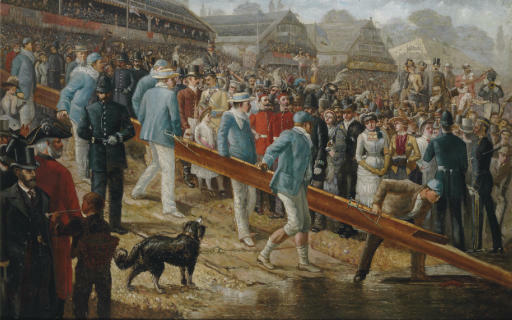 The event was such a resounding success that the townspeople later decided to organise a regatta of their own which duly became the Henley Royal Regatta. In its second year, the Oxford and Cambridge Boat Race took place at Westminster, but because of overcrowding in the capital it soon moved to Putney and shortly thereafter became an annual event. At first the crews wore no distinguishing colours. However, in 1836 Oxford selected dark blue to race in, the colour of their stroke-man's college (Christ Church), and Cambridge adopted the 'duck egg blue' of Eton. This picture can tentatively be dated to 1888 or 1889 as it depicts Stanley Duff Muttlebury, a legendary oarsman, who although partially obscured in the painting, can be identified by his distinctive habit of wearing his cap back to front. Please note that the estimate for this painting should read £25,000-35,000, and not as printed in the catalogue.